My sister is expecting her first grandchild around the end of October. We're all so excited for baby Jack to arrive. I made a different sort of baby quilt. 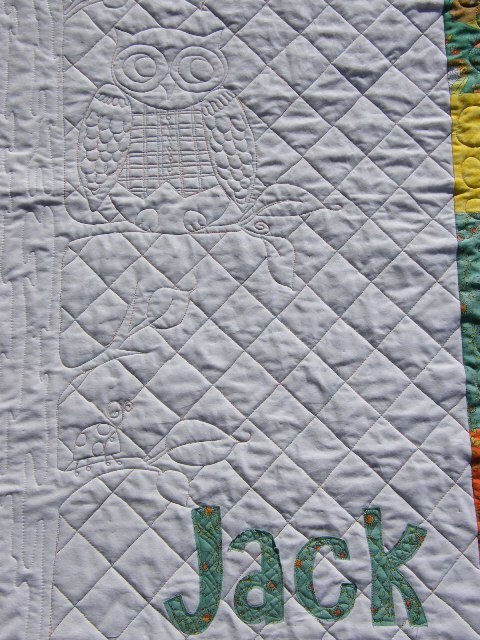 The baby's room will have a sweet woodsy decor and owls are prominent is Jack's room. I found this basic quilt pattern on the Moda Bakeshop Website. It's simple and all white in the center. 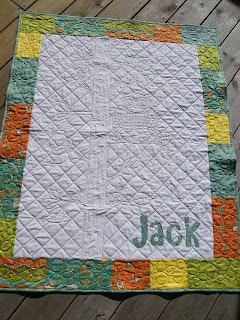 The baby's name is appliqued in the lower corner. 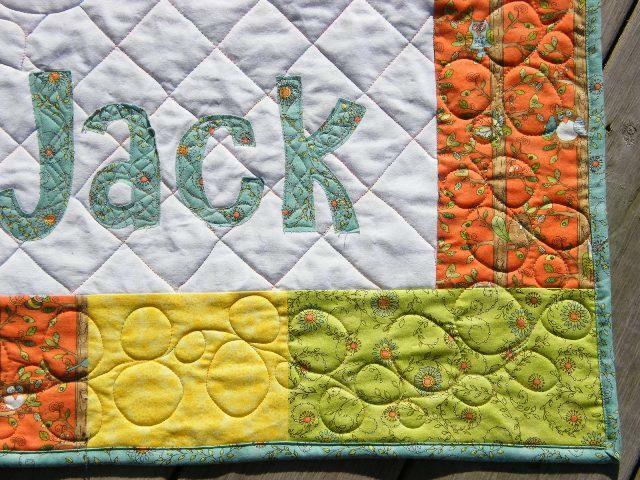 This leaves the entire center that can be quilted. 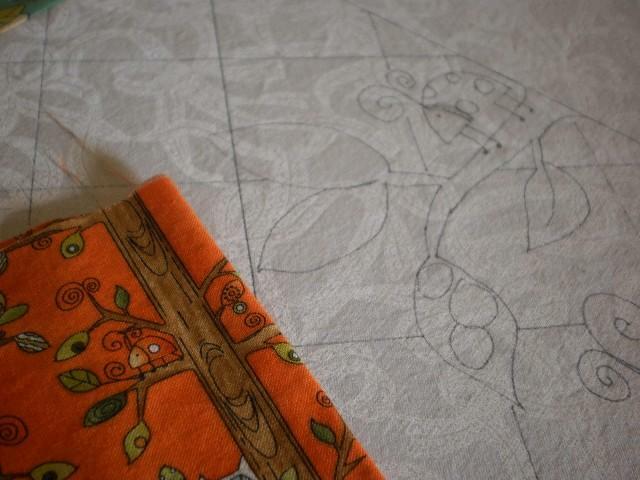 I took a cue from one of the fabrics and drew a woodsy tree with an owl design on the quilt with my friXion pen. ( I LOVE that pen). 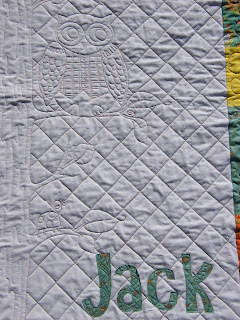 After sandwiching and pinning the three layers, I took a deep breath and started free-motion quilting along my pen lines. I started first with the tree and leaves, then moved on to the owl and the cross hatching. And for the border, I drew a curvy line all around the border. And then used it as a guide to free motion continuous bubbles all around. I like it! With the left over woodsy fabric from Jack's, I made Jack's Mom, a quilted tote from the Bow Tucks Tote bag pattern. 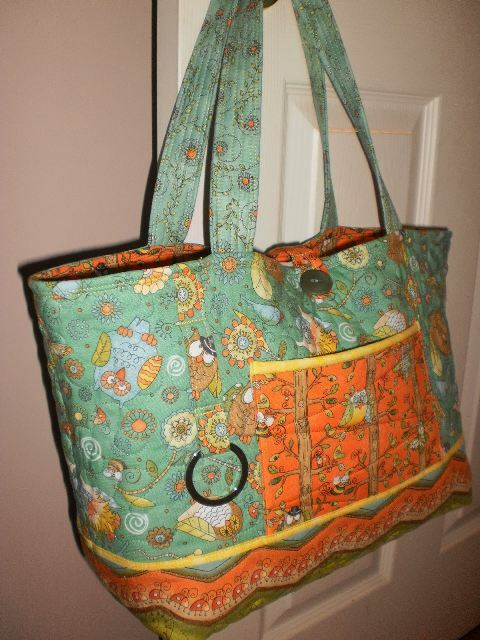 I just omitted the bow tucks on the sides since I'm sure it will be full of lots of baby stuff all the time. And now we wait for little Jack to make his entrance! !